One of the first things I made as a plaything for the children's room was a basic flannel board. Just a picture frame covered in gray felt, glued on the underside and with a bunch of shapes cut from felt and stiffened felt. 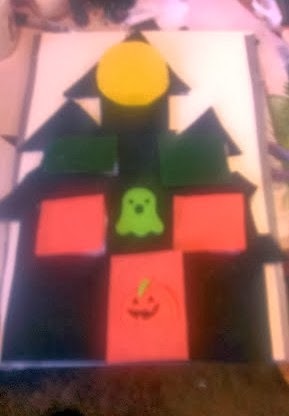 Last year I was entranced by a haunted house play mat that was a Flannel Friday offering. 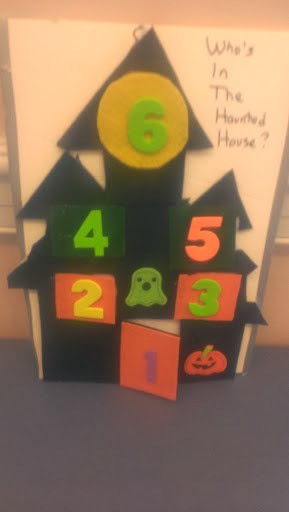 I also loved a set of "peek a boo" boards that Lakeshore Learning makes, but that I just don't have the funding for right now. Craft challenged as I am, I wondered if I could make the boards myself, and perhaps even one for Halloween. 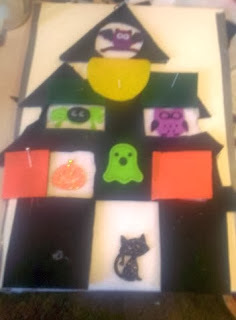 Target did not have the little finger puppets used by the clever crafter who made the haunted house, but between them and Michaels I was able to find a lot of felt and foam Halloween stickers, plus some stiff felt pumpkins in various sizes. By the way, Halloween stuff goes out earlier and earlier. I was out looking for this stuff on Columbus Day weekend, and the selection was sparse. The one good thing is that most of what I bought was on sale! 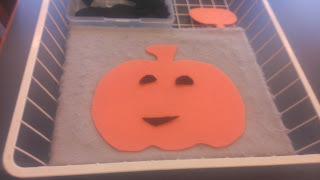 First, I took the felt pumpkins and used them as templates to cut more pumpkins, again out of stiffened felt. I cut various small shapes from some stiffened black felt scraps and voila! A pumpkin felt board was created. If you are even mildly crafty, you can make one of these in minutes. I love coming in and seeing what new faces the kids have made! 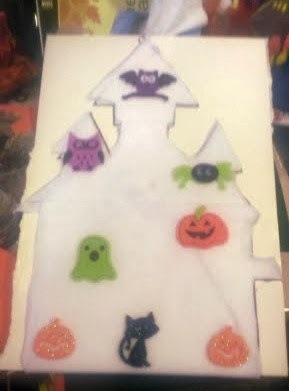 The haunted house was a lot harder, because, as I said, I am craft challenged. I don't cut well and I can't draw. 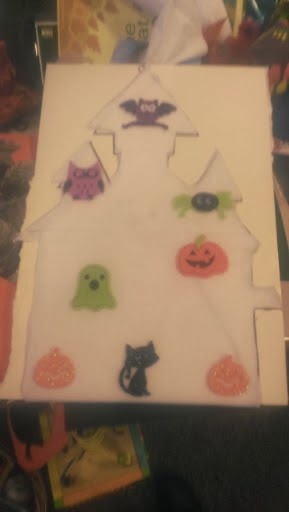 But I trolled the Internet and found a fabulous haunted house template as a craft. You can find the whole thing HERE. 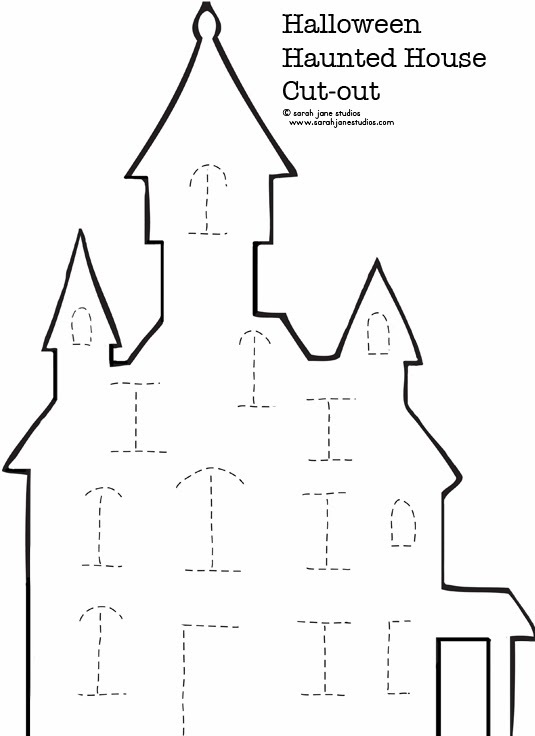 I wouldn't do this as a kid craft--you'd have to cut out a pattern per kid, it's too complicated for preschoolers to do it themselves. But as a pattern--lovely! I printed it out and then enlarged it onto 11X 17 paper on our copier. I cut out the pattern, traced it onto a piece of foamcore board, and then cut and glued white felt onto the board. It was not picture perfect accurate, but if I'd gotten my husband to do this project, it wouldn't have been ready till NEXT Halloween, and I was planning a second layer of felt anyway. I placed various stickers on the board to get an idea of where I wanted to put windows and the door. And then I cut black felt to cover this. I ended up doing the black in several pieces, which enabled me to shape things better. 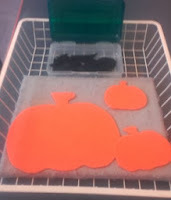 An X-acto knife was used to cut the door and window openings, and then I cut felt shapes for doors and windows pretty much by eye, except for the round window, which I made by tracing a circle that was the right size. I folded the edges of the doors down a little bit like flaps so that they would be easier to open and close. Doors closed! Some doors opened! I bound the cut edges of this with duct tape and put it out for the kids to play with it to see what happened. And promptly found that several of the stickers and most of the numbers had been pulled off! The sticker glue wasn't strong enough to thwart little fingers! So I glue gunned everything back down. We will see what happens next, but this was fun to make and I am definitely going to be making more of these. Next up--a Thanksgiving turkey flannel set, and perhaps a Christmas house--or even one for my "Nutcracker" program! "Getting Blinded", I think it's either your computer or your browser, unless my blog has been nipping at the whiskey my husband likes to add to his eggnog. I have checked the blog on my Android phone (both as mobile and full sites), on Mozilla Firefox and on Internet Explorer and it looks fine on all of those. I'm assuming you don't have Macs or IPads at work, but since I don't use Apple products can't say for sure on those. BTW, the background isn't new--it's the same one I've had since I started this blog. Hope you're able to see things clearly now!